SYDNEY, 9 August 2018 – TTEC Holdings, Inc. (NASDAQ: TTEC), a leading global technology and services provider focused on the design, implementation and delivery of transformative customer experience for many of the world’s most iconic and disruptive brands, today announced it has been recognised as a market champion for contact centre outsourcing services by Frost & Sullivan. The research practice of Frost & Sullivan conducts monitoring and analysing of technical, economic, mega trends, competitive, customer, best practices and emerging markets research. 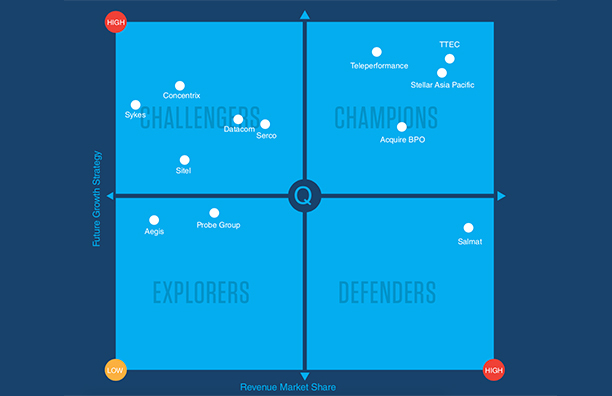 The Frost IQ: Australian Contact Centre Outsourcing Market Report evaluated the top 12 providers in the Australian contact centre outsourcing market relative to the five criteria mentioned above and positions providers across two major attributes – growth strategy and market share – to determine quadrant placement. A custom version of the report prepared for TTEC is available for download at https://www.ttec.com/asiapacific/resources/white-papers-and-articles/ttec-achieves-champion-rating-frost-iq-matrix. Frost & Sullivan is a growth partnership company focused on helping our clients achieve transformational growth as they are impacted by an economic environment dominated by accelerating change, driven by disruptive technologies, mega trends, and new business models. The research practice conducts monitoring and analysing technical, economic, mega trends, competitive, customer, best practices and emerging markets research into one system which supports the entire “growth cycle”, which enables clients to have a complete picture of their industry, as well as how all other industries are impacted by these factors.